Beau's Barrel Room: Raise A Glass To Robert Mondavi! 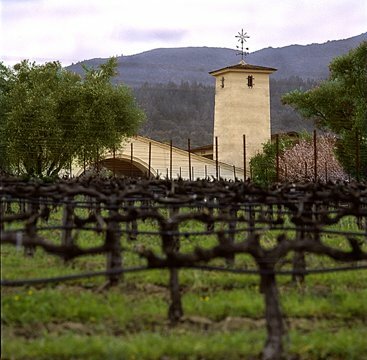 Today would have been (and still is) the late, great Robert Mondavi's birthday. He's the most famous California wine personality around and his eponymous winery (including his still-awesome wife Margrit) will be raising a toast to the man at 2:00pm today. I never met the him personally, but I've driven by the iconic winery many times during my trips up to Napa Valley, and devoured a biography of him a couple of years ago. My dad actually met Mr. Mondavi in the late 80's when he was working at Sherry-Lehman in New York. From what I understand, "Bob" came to town to do a trade tasting and was pouring his wines. What an experience that must have been! Anyways, it's been a while since I tasted any Mondavi wines but they're certainly continuing to garner attention from wine critics and fans around the country. Perhaps more importantly, the man's legacy continues to define and shape Napa Valley, and indeed California, if not the world's wine culture. It is only fitting that we raise a glass to him today and honor someone who did so much for all of us wine drinkers, wine geeks, wine aficianodos, and wine lovers. WHAT: Together with the entire staff of the Robert Mondavi Winery, Margrit Mondavi and Genevieve Janssens, director of winemaking, will celebrate Robert Mondavi’s birthday on Friday, June 17, 2011, with a special open house and global toast at the winery in Napa Valley, which is open to the public. The occasion honors the vast contribution the late vintner made to the California wine industry. At 2 pm, the winery will join together for a global toast to Mr. Mondavi, streamed world-wide on the winery’s Facebook page via livestream. All visitors to the winery on June 17 will receive a complimentary glass of Robert Mondavi Winery 2009 Napa Valley Fumé Blanc. There will be live music from 12:00-5:00pm. WHERE: Robert Mondavi Winery, located on the west side of Highway 29, just north of Oakville Cross Road in the heart of Napa Valley. And worldwide via the internet on their Facebook fan page. WHY: Robert Mondavi’s pioneering vision placed California wines among the finest in the world and made them an integral part of a gracious lifestyle. On June 17 friends and fans from around the globe will gather to celebrate his passion and vision by raising a glass and sharing the stories that created his legacy. (Although the toast and celebration is on June 17, Robert Mondavi’s birthday is on June 18.) In honor of Robert Mondavi, with every new “LIKE” received on The Robert Mondavi Winery Facebook page during June 13th -17th, Robert Mondavi Winery will donate $1 (up to $10,000) to Days of Taste, a non-profit organization dedicated to educating children about the food we eat. Days of Taste is the community action group of the American Institute of Wine & Food, which was founded by Julia Child and Robert Mondavi. VISUALS: At 2 p.m. Margrit Mondavi, winery staff and friends will gather together to toast Mr. Mondavi, honoring his enduring and inspiring legacy. Margit Mondavi and Genevieve Janssens will each share some personal reflections of Robert Mondavi during the toast. The toast will be streamed live worldwide on the winery’s Facebook page via livestream.